Be careful when deleting assets! 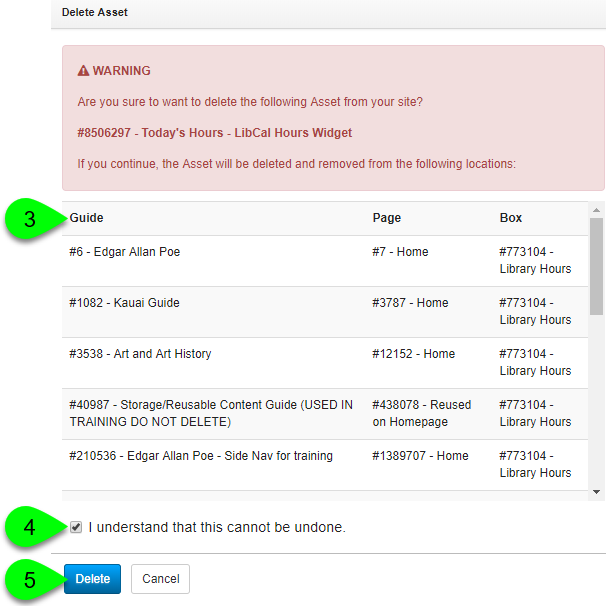 Deleting an asset from the Content > Assets page will permanently remove it from your system and cannot be undone. If the asset is being reused (i.e. mapped) on other guides, deleting that asset will also remove it from those guides. 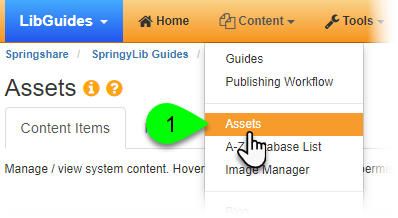 The Mapping Count column will indicate the number of guides where an asset is being reused. Statistics for deleted Link, Document/File, and Book assets will be retained. They will appear in your Assets statistics by their ID number and a name of "[deleted]". Only an Admin, an asset's owner, or a regular user with the Manage Assets permission (CMS only) can delete an asset. Go to Content > Assets. Locate the asset you want to delete and click on its Delete () icon in the Actions column. Review the Delete Asset window, which will indicate all of the locations where that asset is being used. Deleting the asset will remove the asset from each of the guide locations listed. To proceed, select the checkbox next to I understand that this cannot be undone.